The 3rd Annual Women in STEM Research Symposium was held Tuesday, March 21, 2017 in Hodges Library from 8:00 a.m. to 5:30 p.m.. 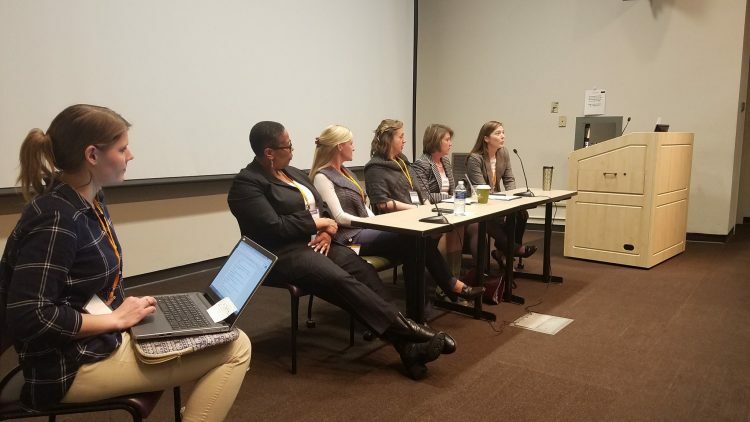 Hosted by Pipeline–Vols for Women in STEM, the symposium featured over 90 presentations from UT graduate students doing research in STEM-related fields, from Animal Science, Kinesiology, and Nursing, to Chemistry, Physics, and Zoology. EEB had a large presence at the event, thanks to Kimberly Sheldon (pictured far right) participating in the panel discussion, Jen Schweitzer, Mike Gilchrist, Ed Schilling, and postdoc Sergei Tarasov serving as judges, and many EEB students contributing oral presentations and posters.